If Oprah Uses Twitter But Can’t Spell, Does It Count? You get a car! And YOU get a car! And YOU GET A CAR! So if you misspell “car”, did the marketing work? 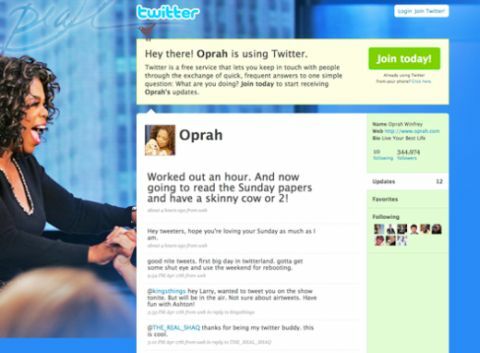 Like so many of us, Oprah is “on Twitter“. And when you’re Oprah, it almost doesn’t matter what you say or how you say it, because people will follow you, turn your word into gospel, and pass that gospel on. But what if you can’t spell? Once again, if you’re Oprah it doesn’t matter. But when Oprah recommended the new Microsoft Surface tablet, but did so while using an iPad—funny enough all by itself—she unwittingly raised some interesting questions about . . . hashtags. I learned about Oprah using an iPad to promote Microsoft Surface at a blog based in the UK. And in reading the ironic story I noticed that Oprah had used the hashtag ‘FavoriteThings’, which, if not a registered trademark of Oprah Winfrey, is certainly a phrase associated with her by millions of people. But the UK-based writer—who also noticed the FavoriteThings hashtag on Oprah’s tweet—referred to her use of the catchphrase using UK-style spelling. At Tom’s Hardware, “FavoriteThings” became “FavouriteThings”. Which means that on Twitter, they don’t match up. Not at all. Google would catch the near-miss, assume it was exactly that, and the Google Artificial Intelligence algorithm would figure out something to do to keep FavoriteThings and FavouriteThings aligned. But Twitter won’t catch the difference. In fact, Twitter shouldn’t catch the difference between FavoriteThings and FavouriteThings, because of what hashtags are used for. And understanding this matters to you, Internet Marketer. Incompatible hashtags are every bit as bad as incompatible video file formats. Oprah has only come up at Answer Guy Central once before. And I haven’t discussed hashtags very much here, because it took me quite a while to wrap my head around how useful the little buggers can be. A couple of years ago I needed my kids to begin my hashtag education, and came away thinking hashtags were stupid. In a mcro sense, hashtags are stupid. My son’s explanation that hashtags “make Twitter more fun” didn’t resonate for me because I was thinking that forty friends trying to find each other by assigning random strings of never-been-agreed-on characters as a sorting mechanism don’t mean anything. But when a hashtag catches fire, it’s a great marketing tool, and the mere use of FavoriteThings, by Oprah or anyone else, is going to get a Tweet noticed. But only in the USA, because in most of the rest of the English-speaking world the correct spelling is FavouriteThings. Again, Oprah doesn’t have to care. But if you’re using hashtags as a marketing tool—and maybe you should be—you might care quite a lot. And, you guessed it: hashtags are a great Search Engine Optimization vehicle. Hashtags, like video, are a game changer. And while simply dropping random noise into Tweets is unlikely to be useful, using hashtags correctly pays off. They’re one small part of Influency*. Want to talk about Influency* and the role hashtags can play in your integrated marketing efforts? Me too.